Ah, the stuffed pepper. Are they not what you serve vegetarians when you can't think of anything else to give them (Come dine with Me contestants take heed)? Actually no, I've been baking these more lately, they are a great vehicle to carry flavour as well as being a pretty convenient serving solution. I also love that sweet, mellow, squishiness once baked. Add that to the fact they are rammed with vitamins E and C (skin creams can only do so much to your face peeps). Also on their site, they include a lot of recipe inspiration including what they call "Pepper pots" - stuffed pepper halves to you and me. The versatility of this is endless, but the recipe below is how I like to prepare them for my family. 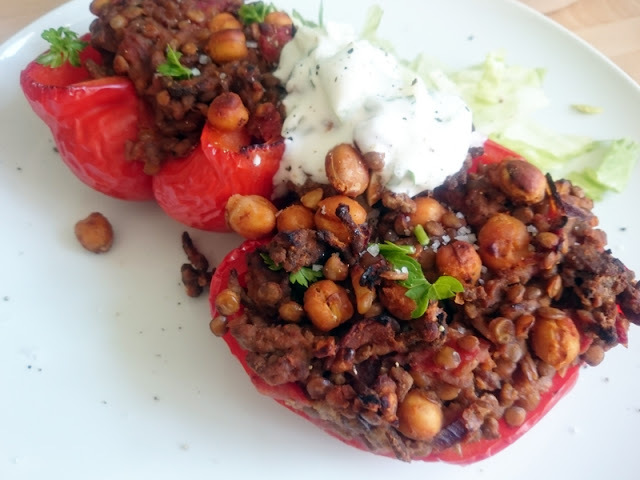 Filled with beef and lentils this is a great combination of Iron and Vitamin C (which helps absorb Iron - bonus). The lentils also make the beef go further so economical as well as healthier. Texture, taste...it's all there as well as being so easy to prepare. Total mid-week hero. Heat the oil in a frying pan. Add the onion and gently fry until translucent. Turn up the heat and add the beef and garlic. You want the meat to sizzle not stew. Break up the meat with a spoon as it cooks until evenly browned. Add chilli powder, smoked paprika, cumin and ground coriander and cook for a minute. Then add the chickpeas, lentils, tomatoes. Season to taste. Once cooked, spoon the beef into the pepper halves and place in the oven. Bake for 20 minutes for firmer peppers or up to 40 minutes if you like them squishy. Let them rest for a few minutes, then serve with a dollop of natural yogurt, a side salad and plenty of chopped fresh herbs. I was sent products for this post by the campaign, content and thoughts, as always, my own.